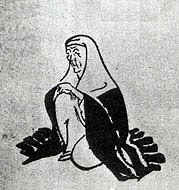 有井諸九尼 (1713-1781) "the Nun Shokyu"
Her haiku name was Kohakuan 湖白庵, says one source. There seems a bit of a mix up of information about her and her husband, Kohaku alias Arii Fufuu. And she was certainly not born in Echigo. During the middle of the Edo period, there was this courageous travelling haiku poetess in the footsteps of Basho, travelling to the Deep North of Japan. She was the daughter of the village headman Nagamatsu Juugoroo 永松十五郎 in Chikugo, Takeno Division, Shimamura Village 筑後国竹野郡島村 in Kyushu. She was married in the village to one of her cousins, but at the age of 29 she made a brave decision that began her wandering life: she was running away from her home with the haiku poet Kohaku 湖白. Another source says his name was Arii Fufuu 有井浮風. She lived with him in Kyoto in a small place called "Tsukumo An"
九十九庵（つくもあん), a place belonging to Gakuta Shozaburo (Shoozaburoo) 額田正三郎, who hid the couple there after they had eloped. When Kohaku (Arii Fufuu) died of illness, she became a haiku poetess herself and took on the name of Shokyu. She was 49 at that time. She travelled (that means walking) many times from Kyushu to Kyoto and in her old age made her dream come true to walk the "Oku no Hosomichi" in the footsteps of Basho. She met the young haiku poet Chomu (Choomu) 蝶夢 and they each build a hermitage in Okazaki (Kyoto prefecture) to revere the memory of Matsuo Basho. Her place was called Kohakuan and his was Goshoo-An 五升庵. He was 34, she was 52 at that time, living like mother and son, one source says. In 1771 she went to Edo. She later returned to the birthplace of her husband and lived in a small hermitage in the mountains called again Kohakuan 湖白庵. She now rests with her husband in a grave at the temple Zuisen-Ji 随専寺 in Nogata. Autumn Wind Collection, "Record of an Autumn Wind", the diary of her walk in memory of Basho. He was a samurai from Nogata in Chikuzen (Fukuoka, Kyushu). He was a student of Shida Yaba, school of Basho disciples. Fufuu left for Osaka with young Nami and made a living as a doctor. He died in 1762. "Died on the seventeenth day of the fifth month, 1762,at the age of sixty-one." Born in Kyoto. He entered Buddhist priesthood at the age of nine at the temple Hokoku-Ji 法国寺 in Kyoto. He became a haiku poet at age 13 under the guidance of Sooku (Soo oku 宗屋（そうおく）. Other names Kuuzoo 九蔵。号を洛東・Goshoo-An 五升庵・Hakuan 泊庵. 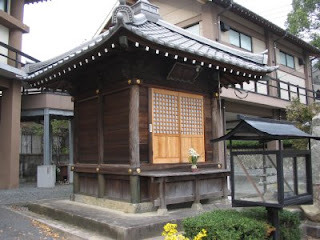 He later became priest at the temple Amida-Ji 阿弥陀寺（浄土宗), Kihaku-In Hermitage 帰白院. "Wife of Shida Yaba's [Yaha's] secretary." "Born in Echigo (present-day Niigata Prefecture), Shokyuu took the tonsure after her husband's death and traveled widely." 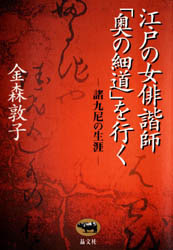 And Sato includes her in his recent book, "Japanese Women Poets: An Anthology." The "forget-me" has bloomed, but ah! I can not forget old days together. originally in "One Thousand Haiku: Ancient and Modern." Tokyo Doobunsha. 1930. Reprinted in "The Classic Tradition of Haiku," edited by Faubion Bowers, Dover, 1996. "Written on the 13th anniversary of her husband's death. 'Wasuregusa' (literally, 'forget-me-grass') is a tiny, emphemeral day-lily." How can I forget them? on the ruins of my burned house. The most famous example of a woman of good family who awoke after an arranged marriage and eloped with her lover is Yanagihara Byakuren, who was born into the nobility. But there were such women even in pre-modern times of course, and the author of this poem was one. Born into a well-off family of Chikugo in Kyuushuu, Shokyuu married a relative, but later eloped with Arii Fufuu, a disciple of Yaba, himself one of Basho's favorite disciples. Fond of traveling, she observed nature with fresh eyes, as in this poem, and became a well-known haiku poet in the 18th century. After her husband died, she shaved her head and became a Buddhist nun. 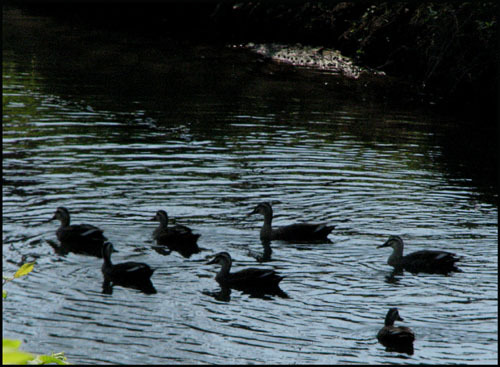 She is walking down to a pond where the ducks are swimming. yuugao, lit. evening face, flowers that start blooming at night. Thanks for introducing the poet. She is so tuned in to the natural world around her. When reading them all on your blog, I feel the one you wrote ( a historical eference 'experiment' ) as well as the original is turning inward to the self and cirmustance (mental musing, L1 and L2), then moving back out to the world of natural phenomena (spring sunshine/spring rain, L3).